LEHIGH VALLEY, Pa. (November 11, 2013) – Discover Lehigh Valley, the official Destination Marketing Organization for Lehigh and Northampton counties in eastern Pennsylvania, is partnering with local businesses to help create new memories this holiday season. 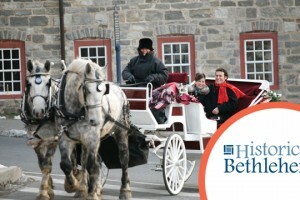 Discover the charm of yesteryear in Bethlehem, Pennsylvania, affectionately known as the Christmas City. Costumed guides will whisk a lucky winner and a guest through the daily life and inner workings of the Moravian culture, bring them on a horse carriage ride through downtown, and pamper them with gift cards and fancy dinners during this treasured Ultimate Lehigh Valley Experience. Visitors can enter throughout the month of November at LVUltimateExperience.com. The Grand Prize winner will also receive an Olympus digital camera to capture their Ultimate Lehigh Valley Experience courtesy of our friends at Olympus. A winner will be announced in the first week of December.